Scrivener is a wonderful program many writers use to set up and manage their books, screenplays, and research projects. Nearly every aspect of the program can be customizable, from the drafting settings to the export format. But with so many options, many authors find themselves overwhelmed. To that end, we’re posting a blog series on our favorite features. 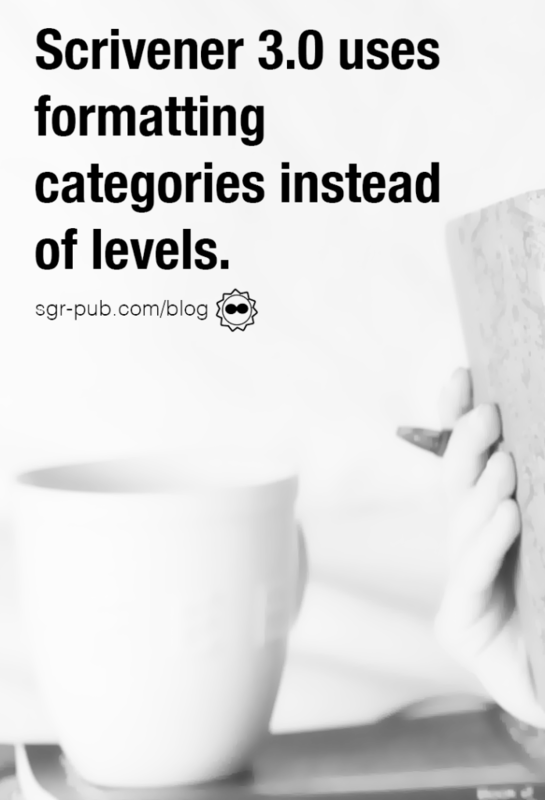 While we could post fifteen blogs on the formatting features, today, we’ll just cover our top formatting hacks in Scrivener. In the Compile setting, you’ll see that the POV is listed there under Level 2+ (we’ll go into levels a bit later). When we compile the draft, we get the POV name along with the image. Sometimes within the text, we want to preserve formatting. That is, the rest of the book is Garamond 12, single-spaced, left aligned, and maybe this one section is a letter, and we want it centered and Times New Roman 13. In this case, we have two options: We can create a separate scene and select “Compile As-Is,” or, the better option, we can highlight the text and use the “Preserve Formatting option.” You can find it under the Format menu, under the Formatting sub-menu. Here you can also find the Copy and Paste Formatting options, which allow you to take the formatting settings from one scene to another. Generally, though, you shouldn’t do too much in-line formatting in your final manuscript. And make sure if you’re using Preserve Formatting that you’ve got your formatting exactly as you want it. 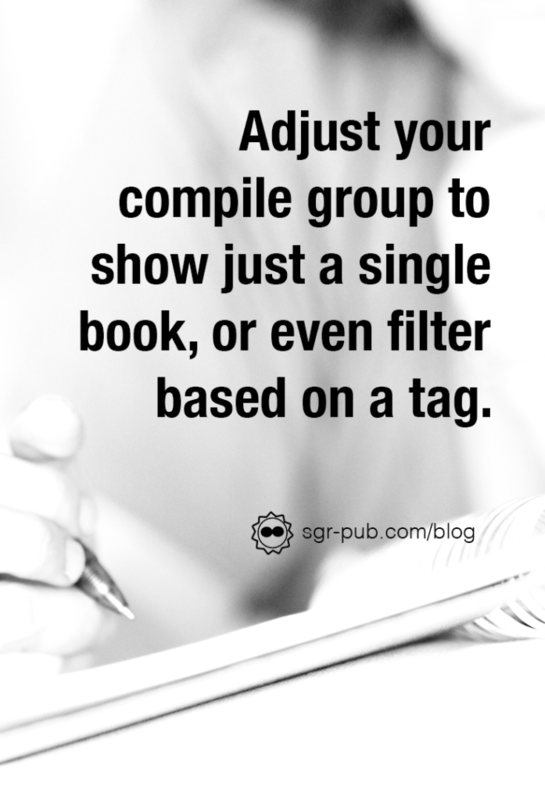 In the Contents section of Compile, use the drop-down menu to select the grouping you’d like to export. Under Compile Group Options, you can select to either include the container (generally you don’t want to do this), and treat selected group as entire draft (generally you do want this). You can also use a Filter based on a particular label. So, for example, if you were compiling a preview of an ebook, you could tag specific chapters with “Preview” and compile only those. Each level can have its own formatting. So your Part would be different from your Chapter, and so on. In Scrivener 3.0, they’ve gone back to the drawing board. Instead of assigning formatting by level, you can now assign formatting by type. So if you’d like your Part and Chapter to share formatting, you can. And if you have a certain set of scenes with particular formatting (like a dream sequence, for example), you can set individual scenes. As formatters, we’re looking forward to this new feature! Our last hack has to do with getting so-called “clean” manuscripts from Scrivener to editable formats like Word. If you’ve drafted your book in Scrivener, then you’re probably already mostly there. In the Compile Format feature, you can add additional so-called “presets,” or settings that you can re-use. This is especially helpful when you’ve got several books in a single manuscript, or if you need to export to hardcover, paperback, Kindle, and more. For exporting a “clean” manuscript, create a project preset using the formatting standards your editor requires. Usually, that’s 12pt, double-spaced letter-sized pages.